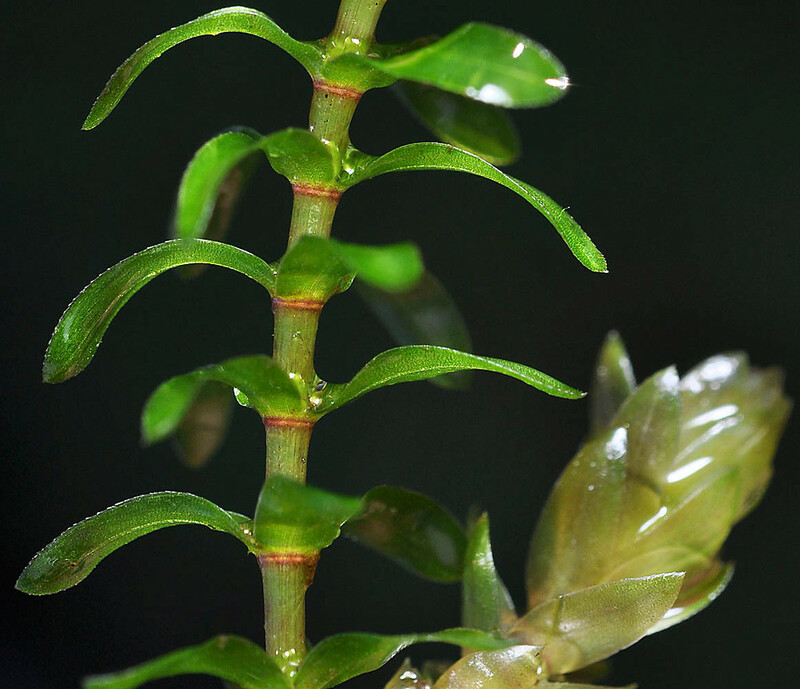 Elodea canadensis plants in bloom. Invasive Plants in Portugal. invasores.pt (Accessed 4/2018). 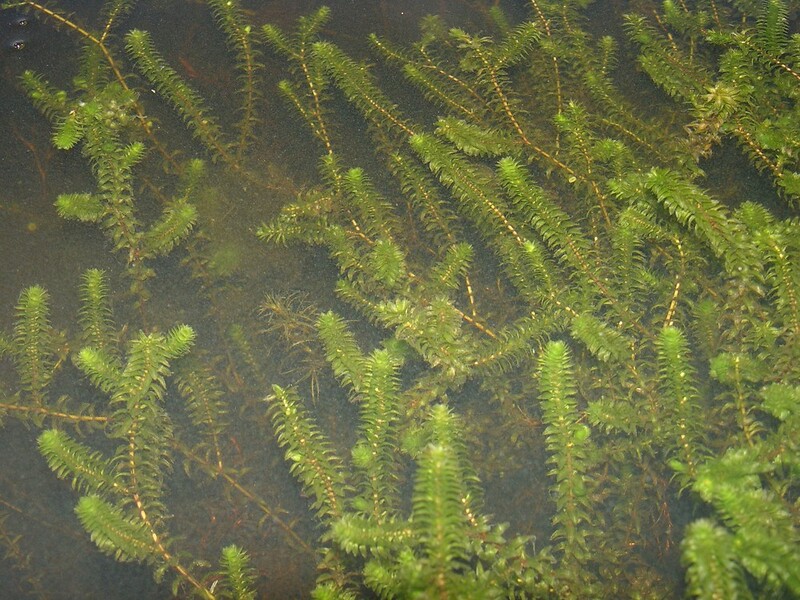 Elodea canadensis plants. Donald Cameron. New England Wild Flower Society. gobotany.newenglandwild.org (Accessed 4/2018). Elodea canadensis is a submerged, rooted or drifting perennial, aquatic, usually in dense beds, dioecious, leafy stems to 1 m long, dichotomously branched, fragile, easily fragmented, roots slender, unbranched, from nodes along stems. Elodea canadensis leaves and stems. By Gerry Carr. Copyright © 2018 Gerry Carr. Oregon Flora Image Project – www.botany.hawaii.edu (Accessed 12/2014). Leaves opposite on lower stem, egg-shaped, small, upper leaves in whorls of 3, 0.6-1.7 cm long, 0.1-0.5 cm wide, linear, margin finely toothed, bright green, closely overlapping toward top of stem, dormant overwintering apices, with densely crowded, stiff leaves, develop in late summer, remain dormant in sediments until spring. Elodea canadensis flowers. Invasive Plants in Portugal. invasores.pt (Accessed 4/018). 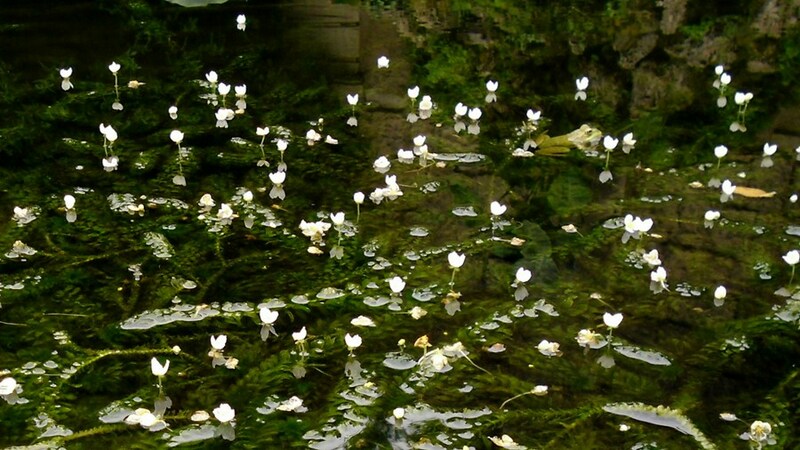 Flowers white, petals to 0.4 cm; elevated to water surface on a thin, elongate stalk to 30 cm long, flower and seed formation rarely occur. Fruit dry, a beaked capsule ca 1 cm long including beak. Frequency in NYC: Very infrequent (or not inventoried). Habitat: Quiet, neutral to alkaline water. Notes: Winter dormancy broken by several days of temperatures above 18º C. Invasion tends to cause water quality changes including increased pH and fluctuations in phosphorus levels. Dispersal mostly by vegetative fragments. Eaten by waterfowl and various insects. Provides cover for small fish and aquatic invertebrates, these, in turn, help control mosquito populations in artificial ponds (Spicer and Catling 1988). Prefers cool (under 25º C), nutrient rich water, 1-8 m deep, pH 6.6-10. Increases dissolved oxygen. Tolerates light levels from 15% of full sun to full sun. Apparently attacked by relatively few insects and diseases (Spicer and Catling 1988).